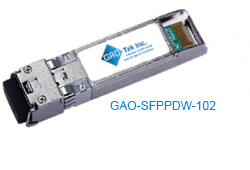 SFP+ DWDM Transceivers | Compatible Optical Transceivers | GAOTek Inc.
GAOTek’s SFP+ DWDM (Small Form-Factor Dense Wavelength Division Multiplexing) transceivers are reliable and efficient devices designed for use in 10-Gigabit Ethernet. Being a leading supplier of advanced engineering equipment, all our products embody our brand promise of quality and safety at an affordable price for sale to the United States, Canada and Globally. SFP+ transceivers support 2-wire serial communication as defined in SFP MSA. They offer increased bandwidth through a greater number of channels and narrower spacing between channels. SFP+ serial ID provides identification information about transceiver capabilities, standard interfaces and manufacturer. The SFP MSA outlines a 256-byte memory map in EEPROM, accessible over a 2-wire serial interface at the 8 bit address 1010000X (A0h). The digital diagnostic monitoring interface of SFP+ DWDM transceivers uses the 8 bit address 1010001X (A2h), hence the original serial ID memory map remains as-is. 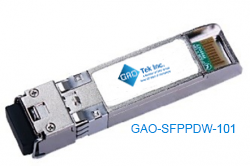 GAOTek’s SFP+ DWDM transceivers are hot pluggable devices with form factor specification compliant with SFF-8432. They have a DWDM EML type transmitter, and a PIN type or APD type receiver, along with a preamplifier. They provide digital diagnostic functions via a 2 wire serial interface. The transceiver houses a Digital Diagnostics Transceiver Controller (DDTC) to monitor diagnostic information. Memory is organized in a series of 8-bit data strings. These devices are carefully designed for low power dissipation.